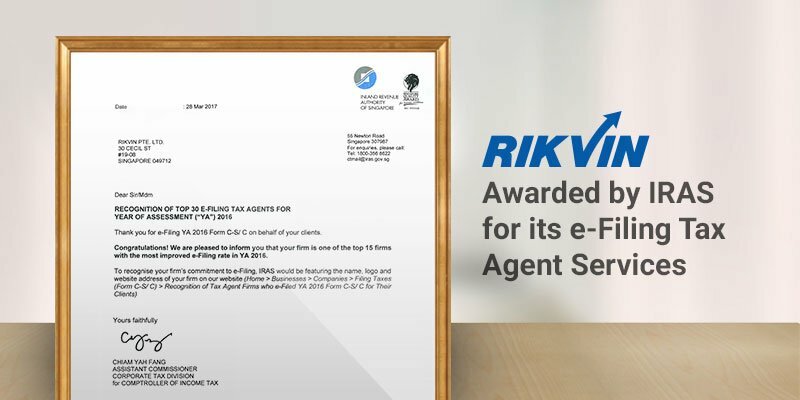 The Inland Revenue Authority of Singapore (IRAS) has recently bestowed official recognition upon Rikvin as one of the top 15 tax agents in Singapore with the most improved e-filing rates. This recognition demonstrates Rikvin’s continuing commitment to IRAS and the taxation regime in Singapore. Since e-filing was first introduced in 2015, Rikvin has steadily increased the number of tax e-filings it has carried out on behalf of its clients. By participating in this scheme, Singapore corporate service providers like Rikvin together with IRAS have brought to the corporate taxation landscape in Singapore greater consistency, reduced compliance costs and efficiency gains as a result of digitalization. Rikvin’s clients have also benefitted as a result of quick, hassle-free and cost-effective e-filing of corporate tax. Other than the clear benefits of adhering to the tax regulations in Singapore, Rikvin’s clients now no longer have to manually and repeatedly fill in common details and refer to company documentation for hard-to-remember information. All of this is now automatically generated by the e-filing platform. Further, with e-filing, calculations are automatically and accurately computed, and automatic prompts ensure no form fields are left unfilled. As Singapore’s leading corporate service provider and tax agent, Rikvin remains committed to IRAS’s schemes and guidelines. We aim to further increase our e-filing rates by getting more of our corporate clients to e-file their tax returns in 2017. E-file your returns with the leading tax agent in Singapore! Our corporate tax professionals can help you e-file your annual corporate tax returns in a timely manner.